Flanders is famous for early music and the festival, workshops and competition held each August in Antwerp attract performing groups and contestants internationally. 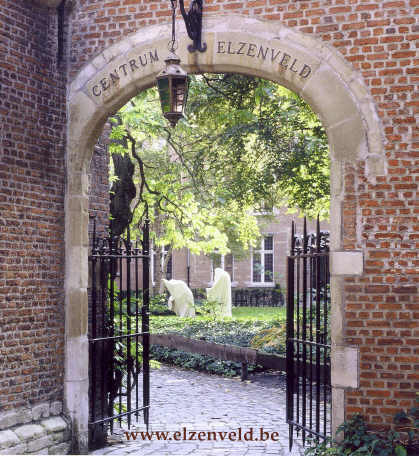 Most of the events were divided between the large Augustinus church and, a short walk away, the more intimate Centrum Elzenveld, a socio-cultural centre 'implanted in the historical buildings of the St. Elisabeth hospital, convent and presbytery', where the competition and the smaller scale concerts are held in the acoustically ideal chapel. Musicians and guests (ourselves included) are housed at Elzenveld, where there is a festival cafe in which to eat, drink and socialise, browse in a wide selection of early music CDs on sale and overear esoteric discussions about how much rosin to use on a rebec, etc etc (click to enjoy a virtual visit around Elzenveld!). Laus Polyphoniae offered a varied programme of 25 concerts, including two of traditional polyphony from Corsica and Sardinia, a music theatre performance for and by youngsters, the final of the fourth International Young Artist's Presentation - Early Music, and two scenic productions to open and close the festival. Ensemble Micrologus gave three new programmes as the ensemble in residence. During our week in Antwerp we were able to hear them and, amongst others, Marco Beasley, the Huelgas Ensemble, Mala Punica and L'Arpeggiata. Hosted by Musica, a primarily educational organisation which shared organisation of the 10 days festivities, this unique event was introduced as a competition which is really not a competition, its unique formula consisting of two days in which up to eight young ensembles are coached informally for their 20 minute presentations, those then given in concert dress before before an international jury, which offers unstinting advice at the end, with opportunities for meetings and copious written notes. There is a CD recording contract for the winner. 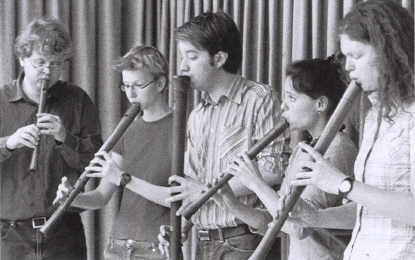 This year the coaching sessions were taken jointly by Jill Feldman, soprano, and Kees Boeke, recorder virtuoso, who commented on the increasingly high standard of recorder ensemble playing, staggering indeed for one who attended recorder classes more than fifty years ago! The deservedly successful group was Ensemble Mikado from Vienna. Everyone seemed pleased and satisfied with that decision, as were we (not always so - see Musical Pointers competitions section!). Worthy runners-up, in our opinion, were B-FIVE (illustrated) and Compagna della Lauda (click to hear them!). All the proceedings were conducted entirely in English, the lingua franca for conversation amongst participants from many countries, with which everyone seemed comfortable. The coaching sessions and concert were open to the public, free of charge, as was participation for the invited groups, selected from openly advertised applicants who had submitted CVs and demo CDS. (One appropriate comparison is with London's Park Lane Group Young Musicians Week of contemporary music held every January, in which the "prize" is a one-hour appearance before a knowledgeable and influential audience). Both are aimed to encourage young musicians and to promote them within the international music scene. This course for non-professional adults adopted a similar scheme, but without the competitive element. Festa's Contrapunti is a masterwork, fully comparable with J S Bach's Art of Fugue. 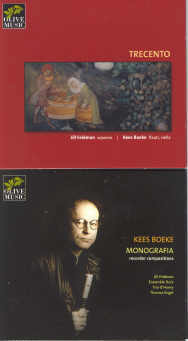 It consists of 125 variations on the popular cantus firmus melody La Spagna, and an invitation to follow Kees Boeke's expositions, with scores provided by Musica, was revelatory. Technically, they were not too difficult for the wind and viol players attending the workshop; in his coaching sessions of a group of the pieces Boeke split his pupils into three groups who worked in different rooms in the centre. It became abundantly clear that Festa was a composer of unsurpassable imagination and ingenuity! The concert in the chapel encouraged many of us to acquire a CD of 32 of the Contrapunti ( Huelgas-Ensemble/ Paul Van Nevel Harmonia Mundi-801799) and I was pleased to add another of Costanzo Festa's music, in expert and breathtakingly beautiful accounts of this composer's Motets, with Cantica Symphonia directed by Kees Boeke (Stradivarius 33585). This group's hour of experimental 14 C music, given in the Elzenveld chapel, was for us the high spot of the whole Polifonia Italiana Festival. It was devoted to Italian successors of Guillaume de Machault, Tuscan composers of the "Trecento" who wrote complex music in a spirit of avant-garde. Francesco Landini was omitted because his 146 works demand a whole concert to do him any justice; instead Tetraktys gave us a sequence of madrigals, caccias and ballatas by other Italian composers of the "ars subtilior" generation, written roughly between 1350 and 1400, to be found in the treasure trove of the Squarcialupi Codex. Suffice it to say here that Jill Feldman sang with exquisite sensibility and beauty of tone. This text-driven music proved captivating, indeed revelatory, even without being able to understand more than an occasional word. The recital, which has been recorded for release next year, made it irresistible to acquire her CD of duets with Kees Boeke by Matteo da Perugia, Johannes Ciconia and others, which is supplied with fascinating notes and explanations and all the texts in several languages. Whereas three-part writing became the norm in France, in Italy two part writing retained an important position and is recorded on Olive OM 002 in its pure form, without any 'fanciful but historically unfounded' completing parts. Do explore their website, its ingenious address hinting at their non-musical activities, which include production of wine and olive oil in Tuscany (www.o-livemusic.com)! You will even discover that Kees Boeke is no mean avant-garde composer of music for recorders and electronics; his Monographia (Ensemble Duix Olive OM 001) is verily ground breaking and made refreshing listening after a day of music from 500 and more years earlier. Of the other recitals heard in the chapel, the most illuminating and memorable were from the Orlando Consort, Ensemble Braccia with Haru Kitamika (early 16th century Musica Nova music for violin band and organ by Venetian composers of the 1530s; Parabosco, Segni and Willaert) and some exotic singing from Corsica and Sardinia, with the grafting of a polyphonic folk style on a Gregorian and Byzantine liturgical tradition. For a writer from abroad there was one curiosity, which unavoidably dominated our feelings during the Polifonia Italiana festival as a whole. As was the case for most of the musicians we talked with, Flemish is an impenetrable language, yet the lavish programme book with essays and translations of the vocal texts (their originals in Latin, Italian, medieval Italian and French) was provided solely in Flemish - a significant alienation for visitors from abroad, most of whom speak good English or, certainly, French. So we listened to a festival of mainly vocal music, with themes of great potential interest, without grasping the context and meaning of more than an occasional word, having to take it as if it were absolute or instrumental music. Our frustration was tempered afterwards by recourse to CD notes, and with the help of a floppy disc compiled from original texts which had been supplied by participants to the organisers for translation into Dutch. Cost of multilingual presentation is of course an essential consideration, but in conversation with local residents (all of whom had excellent English) it appeared that political issues also played a part, and that the fight for Flemish independence had not been entirely won? Our first concert, in the large Augustinus Church, had been a disconcerting experience; a one and a quarter hour succession of Italian songs, without interval; mostly strophic and accordingly very dependent upon text to hold attention for such a long span of short items. Marco Beasley has a pleasant flexible light tenor voice, but there was insufficient variety in his delivery to sustain a whole concert. The accompaniment was mainly for three lutes which, to speak frankly, are certainly not three times as effective as one, and became blurred in a less than ideal acoustic, even though we were towards the front (we later discovered there was greater clarity at the far back!). Sometimes a chamber organ made for change, and one of the lutenists brought more vigour into the proceedings by exchanging his instrument for baroque guitar. Lunchtime the following day the Orlando Consort lifted our spirits. The four British singers gave a stupendous hour of complex music from Mantua and Venice. Counter tenor, two tenors and bass, they rang the changes of timbre in twos and threes, leaving us completely undeprived by the absence of instruments, which some groups use with singers for similar music. Some of the motets had two texts, set to be sung simultaneously, the contrapuntal complexity as extreme as any in later periods; here, the meaning of the words was of lesser account, with the listening ear fully engaged by the dazzling part-writing. Londoners should try to catch their appearance at QEH, 29 September. Mala Punica gave us fancifully embroidered lighter music of the period, moving around the Augustinus Church and improvising embellishments devised by Pedro Memelsdorff that tended to overwhelm the relatively simple substratum of this homely music. Opinion was sharply divided between those who relished his imaginative recreations for our time and others, your reporter included, who found it anachronistic, post-modern early music which (in smaller doses) might widen horizons and bring delight to the audiences of BBC Radio 2 and Classic FM. We visitors from abroad, nearly all not Flemish/Dutch speakers, were hampered by introductory notes solely in the native language, even though the participants too were multi-national. A great deal of the festival's music was vocal and text driven, and with words being sung were in a mixture of medieval and and later Italian, Latin and old French, given in the originals and translated into Dutch, so that the orientation and perspective of many presentations passed us by, so our reports are necessarily brief. This pre-Monteverdi opera, the first to have survived, was first seen in Florence, 1600, and so just squeezed into the scheme of this pre-Baroque festival. Commendably, it filled the converted cinema De Roma. The festival's larger presentations have tended to aim (with outstanding success) in attracting large audiences to enjoy unfamiliar rennaissance music, heightening its appeal by fielding varied instrumental line-ups, and, in this csase, costume, choreogreaphy and lighting. 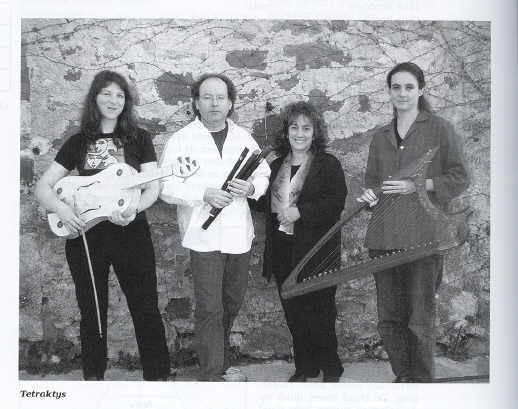 Older early music aficionados may have felt with us that we had been there before. David Munrow entranced us during the '60s with concerts in which he deployed (and played himself) a large array of (then) rare instruments in carefully planned thematic sequences (always with an interval to encourage animated discussion); Raymond Leppard introduced 17 C opera to Glyndebourne with attractive orchestrations, now considered over-the-top romantic and unauthentic by purists. There followed a few decades of austerity; now, operating in a highly compeitive market, new experiments are being tried and it must be stressed, those were enthusiastically received by the Antwerp audiences. La Rappresentatione di Anima et di Corpo required eight soloists, supported by small groups of singers representing souls blessed and damned. It has a Prologue and three acts, these divided into five to nine scenes each, the whole played continuously in Christina Pulhar's production which we could only glimpse intermittently in the flat seating, with a stage only slightly raised, so that we could not see her playing theorbo and baroque harp, when not standing to conduct; an imposing figure with waist length red hair who may be bidding to vie with the fetching and demonstrative Christie disciple, Emmanuelle Haïm. This staging is a co-production with Utrecht's Early Music Festival and hopefully their audiences will have been blessed with a more suitable venue. Our difficulties were compounded by the decision to play the opera with the auditorium in darkness and without intervals for us to try to work out where we were in the moral saga and who were the singers. We were able to see a vigorous dance by Vanity and fights between Good and Evil. The Prologue was given in a disconcerting, and disorienting but not unattractive, modern dance routine, which warned what might be in store, but relative normality was restored for a time in Act One. Later, one of the scenes was taken by a jazz singer, and we enjoyed it. I expected more of the same to round off the proceedings, but the ending was an interminable Chaconne of Paradise and Hell in which everyone had their turn and the instrumentalists each took a solo spot, the bassoon and, most strikingly, the cornetto excelling. On the way home we were assured that this entertainment had not been Cavalieri's famous work. Antwerp is a compact and delightful city in which to spend time, even in this summer's unusually inclement weather and the experience of a week of saturation in pre-Baroque music there was invigorating and rewarding, and it enabled us to hear composers we ought to have known better, and highly reputed musicians some of whom, so they explained, had not yet been invited to perform in UK, thought by some to be both parochial and expensive to visit. Most of those taking part have websites which are easily accessed via Google, and on them you will find CDs, both commercial ones and promos which may be available on request. Many direct links have been provided above (some to sound samples) and it is hoped that these will have enhanced reading pleasure? 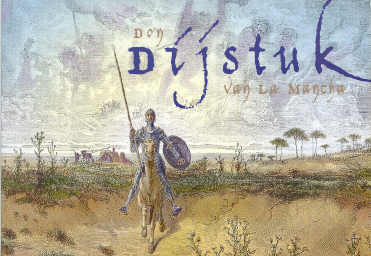 The last word goes back to Musica, for a dazzling childrens theatrical representation of Don Dijstuk van La Mancha, conceived and directed by Liesbet Vereertbrugghen with a large cast of children of remarkable aptitude at The Palace. Its musical basis was the solo part of Richard Strauss's Fantastic Variations on a Knightly Theme, played on stage by a great locally based cellist, Roel Dieltiens, supported by flamenco artists and young puppeteers who manipulated complicated sequences with such aplomb that we did not feel deprived by not understanding the Dutch recitations. Besides traditional flamenco, there was 16 C dance music by Juan del Encina, Diego Ortiz and the ubiquitous Anoniem. Some of the dances, pop of the period, were arranged for band with saxophones and drumset, completely convincingly, and indeed more so than Christina Pulhar's self-conscious updating of Cavalieri. An only regret was that we did not hear more from that youthful team.